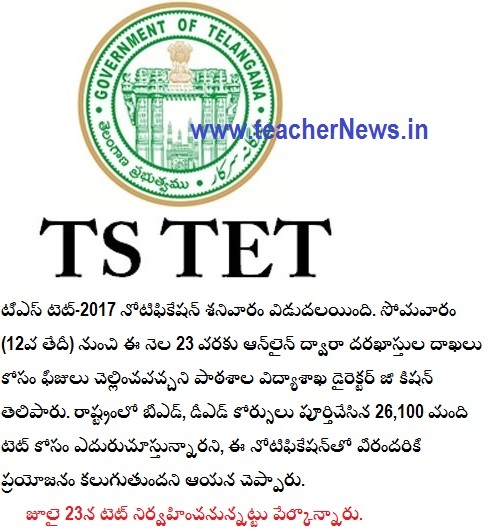 Telangana/ TS TET 2017 Online Application, Notification, Exam Date at tstet.cgg.gov.in: TS TET Application Form / Notification 2017 Telangana Teacher Eligibility Test 2017 Telangana TET 2017 Online Application, Application Form of TS TET 2017 Telangana TET Application Form 2017 Telangana TS TET 2017 notification to release on June 10, apply for 8792 posts. Telangana TET Exam Online Applications , Last Date 23-06-2017 , notifications , Telangana Teacher Eligibility Test , tstet.cgg.gov.in , tstet 2017 , TS DSC 2017 , TSTET- 2017 Online Application, tstet notification 2017 Notification. Telangana TET Exam 2017 Online Application Last Date 23-06-2017 at http://tstet.cgg.gov.in TS TET 2017. 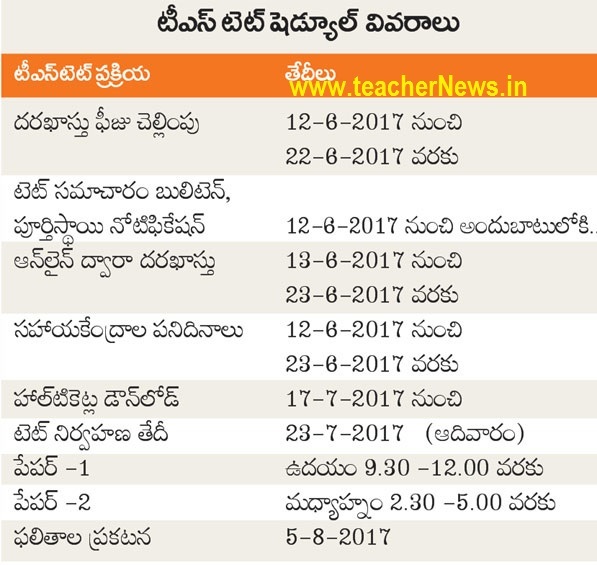 TS TET 2017 Notification Telangana State Teacher Eligibility Test 2017. Telangana State conduct Teacher Eligibility Test Exam two papers.The candidates who intend to be teachers I to V have to appear for Paper I and The candidates who intend to be teachers VI to VIII have to appear for Paper II. The candidates who intend to be teachers I to VIII have to appear both papers, Paper I and Paper II. Previous TET Marks Analysis in AP TET Exam. The candidates should have a Inter /Senior Secondary / Degree with Teacher Education Courses by the NCTE or RCI / Language Pandit Training Courses. Candidates who are pursuing final year any Teacher Education Course or Language Pandit Training Courses can also appear for the TSTET 2016. The minimum qualifications prescribed for a teacher for I to V classes (Paper I) and VI to VII classes (Paper II) and Structure, Content and Syllabus of 5th TSTET will be notified in the notification. Eligible candidates apply through online mode only. TS TET Notification 2017 released at www.tspsc.gov.in. Telangana TET Online Application form start from 16-06-2017, TS TET Online Application form @tspsc.gov.in. Telangana State Teacher Eligibility Test 2017 Online Apply Process, TS TET Paper I & Paper II Exam Application form Download.